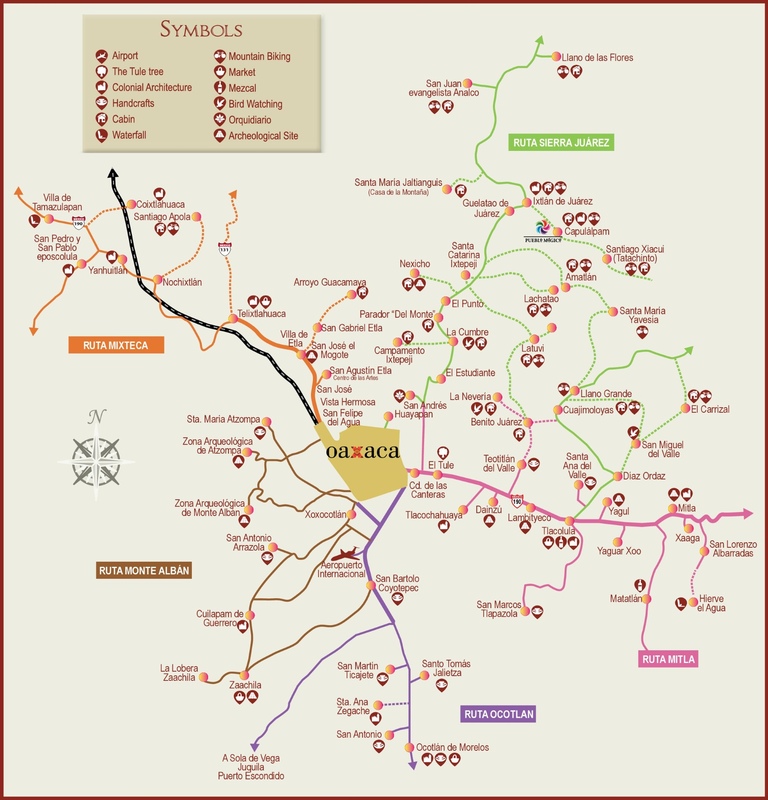 Here are some of the most commonly visited places in the city of Oaxaca and the Oaxaca Valley. San Bartolo Coyotepec – black pottery. Don’t miss the museum there with a fine collection of the pottery. Basilica de la Virgen de la Soledad (Our Lady of Solitude), 107 Avenida Independencia, Centro. Soledad is the patron saint of Oaxaca. The small park outside the church is a favorite spot for festivities and people watching. Templo de San Jerónimo Tlacochahuaya, intricately painted ceiling with lovely restored organ in the town of Tlacochahuaya. Templo San Matias Jalatlaco, Miguel Hidalgo between 5 de Mayo and Aldama, Jalatlaco. Fine recently restored organ, many festivities. Templo de Santo Domingo de Guzman, corner of Macdonia Alcalá and Gurrión. The inside of the church has been lavished with gold leaf and it is often the site of weddings, etc. of the city’s elite. The plaza in front of the church is a major gathering spot. Arte de Oaxaca (Gallery), 105 Murgia, Centro, Free. In addition to a large selection of Oaxacan artists, it also has a permanent exhibition by Rodolfo Morales. CaSa - Art Center at San Augustine Etla, Vista Hermosa, San Augustine Etla. 10 to 6 pm every day, Free. Gorgeous restoration. It is a former textile factory and also offers classes. Casa de Juarez, 609 Garcia Vigil, Centro. Open 10 to 7 pm, closed M. Benito Juarez lived in this beautifully restored house. Galeria 910 Contemporary Art. Free, 305 Macedonia Alcala, 2nd floor, Centro. 10-9 pm M-Sa, 3-9 pm Su, Free. Galleria Azomalli, 110 A. Gurrion, Free, Plazuela de Santo Domingo, Centro. Galleria Gorila, 213 Crespo Interior #1 between Morelos and Matamoros, Th 2-8 pm only, Free. Glass, ceramics, body modification and Street art. Galleria Quetzalli, 104 Constitución, Centro. 10-2 pm and 5-8 pm M-Sa. Free. Henestrosa Library at the Casa de la Cuidad, Corner of P. Diaz and Morelos. Centro. 9 to 8 pm daily, Free. A large library in Spanish. The exhibition areas include a large aerial map of the city that can be walked on. Museo Beiber Jimenez, 307 Matamoros (corner Tinoco y Palacios), Centro. 10-2 pm and 4-8 pm M-F, 10-2 pm Sa. A wonderful museum of Jewelry, pottery and clothing. Large gift shop. 30 pesos. Rufino Tamayo Museum, 503 Morelos, Centro. 10-2 pm and 4-7 pm MWThFSa, 10-3 pm Su, closed Tuesdays, 30 pesos. Fine collection of Mexican antiquities from the personal collection of artist Rufino Tamayo. Santo Domingo Cultural Museum (Museo de las Culturas), M. Alcala at Allende, Centro, 45 pesos. A magnificent cloister houses historical displays including the treasures from Tomb 7 at Monte Alban, as well as temporary exhibits and a nice gift shop. State Museum of Popular Art (MEAPO), in San Bartolo Coyotepec, is a small museum featuring the town's fine black pottery as well as other handcrafts and folk art. Worth the short trip from Oaxaca. Small entrance fee. Taller Tamayo, 514 Ave. Juarez, M-F 8-8 pm, SaSu 10-12 noon. Free. Exhibitions and workshops. The markets listed are permanent markets and open every day. Yet each market has a special day when it three times the size being surrounded by a tiangus. Be on the lookout for pickpockets and purse slashing. Best to take only what you will need and leave the credit cards in the city. Wednesday: Villa de Etla, by bus or collectivo from Abastos. Due to better water supply in this end of the valley, the Etla valley is the home of great Oaxacan cheeses. Also incredible tamales and barbacoa. Thursday: Villa de Zaachila, by bus or collectivo from Abastos. A large draw is the separate animal market nearby. And as usual, great food. Friday: Ocotlan de Morelos, by van or collective. About 20 miles south of Oaxaca, a large Zapotec market. Famous for foods, leather, mescal, ox yokes, and a visit to the restored church. Sunday: Tlacolula De Matamoros – by bus or colectivo south of Oaxaca on the way to Mitla. This is the largest of the weekly markets (and the one most often visited by tourists) It is amazing and again a wonderful church to visit. Merced Market - the corner of Ave Murgia and Calzado de Repulbica, about 8 blocks east of the zocalo. Also known as Mercado Democracia. Open every day, but Sunday is the main day. Excellent comedors. Mercado Sánchez Pascuas – Just north of Calle de Quetzalcoatl on Calle Perfirio Diaz. Another excellent local market with great comedors, flowers, meats and vegetables. Mercado 20th de Noviembre - 2.5 blocks south of the west side of the zocalo on Ave, Flores Magon Mainly a market to go to eat. Great comedors, chocolate and mole sold at the south side. The Pasillo De Carnes Asadas is an área on the east side of market where one can choose meat and have it grilled for you. Then buy salsa, onions and more. Mercado Benito Juarez - 1 block south of the west side of the zocalo, on Ave Flores Magon. This is the most touristy of all the markets and seems to have everything. Clothes, cheese, flowers, baskets, coffee, meat, nuts, vegetables, toys, fish, candy and much more. Open every day. Mercado de Abastos – Often just called “Central”. Go east on Las Casas (Ave. Colon) about 8 blocks from the zocolo. It is GIANT. The busy day is Saturday, with Tuesday also being busy. Product comes to it from all over Mexico and beyond. Many buses go there. Centro is the zocolo, Central is this market. Every product seems to have an area, the pumpkins are not with the vegetables, the fish is all together, the dishes and pottery are separate, the animal supplies are at the other side and further back is wood and furniture. Please exercise caution when going. No gold jewelry, no wallets or purses. Take only what you need safely tucked away. Prepare to be overwhelmed. Mercado Hidalgo - In Colonia Reforma, north of the centro. At the corner of Calle Palmeras and E. Carranza. A neighborhood market with an upscale twist. Always the best produce. They carry fresh cranberries for the season! Beautiful flowers, good meats. Mercado de Artesanías – 4 blocks south of the Zocolo on JP Garcia. Perfect place to find a treasure. Individual stalls with all the products of Oaxaca – rugs, weaving, clothing, carvings, tin. Reasonable prices. Tiangus de Llano – This market is no longer at Llano Park. It has been moved along the street of Curtidurias, just east of Ave. Vasconcelos. (Go one block south of Llano, go east on Cosejoeza - continue about 5 blocks to Ave. Vasconcelos, the name of the street will change) The biggest Tianguis (weekly market) in Oaxaca Great eating, shopping and people watching. Many of the same vendors are at other locations on different days. The word tianguis comes from the Nahuatl (the language of the Aztecs) "tianquiztli" which means marketplace.